5 hours agoWe Answer Your Questions About the Latest Disney World Changes8 hours agoDisney Springs' Amorette's Patisserie Has Egg-Cellent Easter Egg Display21 hours agoCelebrate Hollywood Studios' 30th Anniversary with Special Treats, Drinks, and Classic Eats22 hours ago"Villains Unite the Night" Coming this Summer to Magic Kingdom's Disney Villains After Hours1 day agoDisney World's "Secret" Character Meet And Greet Locations1 day ago6 Disney World Things We're Excited for in 2019 That AREN'T Galaxy's Edge1 day agoWalt Disney World Swan Resort's Garden Grove Hosts Easter and Mother's Day Brunches2 days agoWhy Don't Disney Resorts Sell This Merchandise? We’ve decided to collect and share our answers to this question with all of you, in case you are struggling right now. – Clouds and puddles start to look like Hidden Mickeys to you. – You make pancakes in the shape of Mickey without even knowing you are doing it. – You’ve been humming “it’s a small world” all day. – While on your morning run or walk you start daydreaming that you are actually walking up Main Street, USA while eating a churro/popcorn/cookie. – You’re eating ice cream at home and in your mind you’re really eating a Dole Whip. – You wear your Mickey Ears while cleaning the house, or running errands, or mowing the grass. – You realize you need just one more mug/trading pin to complete your collection. – You cry during the opening credits of Disney movies because you miss seeing Cinderella Castle in real life. – You stand at the kitchen sink doing dishes and are daydreaming you are really sitting in front of a Beaches and Cream Kitchen Sink Sundae. – You buy everything you see in stores that has Mickey on it from lawn ornaments and greeting cards to toys and clothes. – You look out the window of your office and instead of seeing the parking lot you are picturing Main Street USA and Cinderella Castle. – The local fireworks shows no longer impress you after seeing Happily Ever After. – While watching the local fireworks show you wonder where the dessert party is being hosted. – While taking down your American flag at night you find yourself re-enacting the Flag Retreat Ceremony. – You get on your commuter train or bus and have to stop yourself from saying aloud, “Please stand clear of the doors” as the doors close. – You realize your social media feed is 95 percent Disney World-related. – You tear up because you miss Disney World so much when reading AllEars.Net. – You can actually taste the food being reviewed on AllEars.Net and just need to have it now. 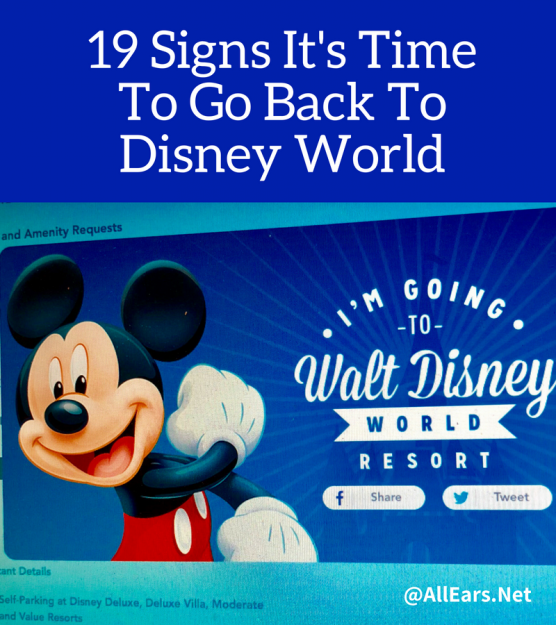 Those are just a few of the ways we know it’s time to go back to Disney World. How do you know it’s time to go back to Disney World? Share your reasons with us below! You start planning where to eat, which parks to do on which days, and what to pack and take, and you don’t even have a trip to go on or in the near future! You try to pay for groceries with Mickey dollars. While my husband was reading this aloud, I was making Tonga Toast for breakfast and Disney Parks music was playing in the background. Thankfully we have a trip planned that’s coming up soon. Not too sure how much longer we can hold out!! DEBK replies: Exactly! Hope you enjoyed your Tonga Toast.